Roma Sprung (Porter ’74, biology), is eager to reconnect with the campus she left behind. On Alumni Reunion Weekend, from April 26 to 28, Sprung and hundreds of other prodigal Slugs will get their chance. With a full weekend schedule of events, UCSC grads will have many opportunities to make brand-new collegiate memories at a series of exhibitions, tours, discussions, lunches, and receptions. And while they make new memories, they can also preserve their old ones by bringing in their vintage college-days photos to the campus library and getting them digitized for posterity. Meanwhile, alumni are generating excitement, and a large dose of nostalgia, by adding their digital UCSC photos to an online album that is already chockablock with images that are bound to bring back the old days, from an image of “Banana Slug Suckers” to shots of the Quarry Plaza and a slimy banana slug making its slow way through a redwood forest on campus. The weekend, with a “Go To Your Happy Place” theme, promises to attract a lively mixture of old-timers and “pioneer’’ class members who can remember the trailers and portables of vintage UCSC along with younger alumni just starting to make their way in the world. In its 48 years, UCSC has grown an alumni base of over 80,000 graduates who are leaving their marks in industries as diverse as entertainment, law, politics, and medical robotics. UCSC is also a relatively young institution with a robustly youthful alumni base. An estimated 50 percent of UCSC’s total alumni graduated since 1997. Alumni of all ages and interests will be treated to a wide-ranging menu of events. For Sprung, this will be a great opportunity to catch up with one of the presenters, Robert L. Sinsheimer Prof. of Molecular Biology Harry Noller. 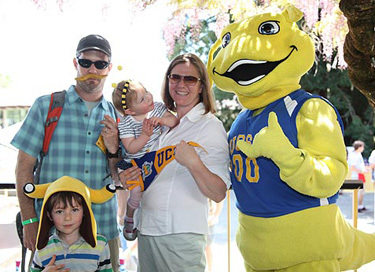 Donna Mekis (College Eight ’84, anthropology; education M.A., ’91) is so excited about the reunion that she’s personally invited 25 other Slugs to attend. Mekis, a vice president of the UCSC Alumni Association, said that the campus’s looming 50th anniversary celebration in 2015 is adding a sense of history and gravitas to the next few reunions. Mekis has a longstanding connection to campus, and not just because she’s a Slug. Between 1984 and 1991 she worked in the Admissions Office, coordinating the transfer admissions program. • Teach-Ins: An Academic Afternoon: Saturday, April 27, 2:30-4 p.m., Porter College Rooms. Read the feature story about this ground-breaking event. • a celebration of the late Don Rothman, a beloved emeriti writing lecturer.